The November 2016 election of Donald Trump and continued Republican control of both the House and Senate has contributed to policy uncertainty and market volatility. While President-elect Trump’s fiscal proposals have been lacking in details, we believe that the stage has been set for potentially significant tax reform, the likes of which the municipal market has not seen since 1986. Trump’s preliminary plans, coupled with a probable interest-rate hike in December, could alter the supply/demand dynamics in the municipal market for the foreseeable future. At IR+M, we believe that our structural convexity advantage may provide a positive offset in this rising interest-rate environment. While details on Trump’s tax plan have been slow to emerge, we do know that they center on a reduction in personal income tax rates and a consolidation of brackets. Specifically, Trump has proposed decreasing the number of brackets from seven to three, and lowering the individual tax rates to 12%, 25%, and 33%. These potential changes could lower overall demand for municipal bonds. Additionally, Trump has mentioned the possibility of eliminating the alternative minimum tax (AMT) and allowing companies to repatriate overseas profits at a reduced rate of 10%. To offset the immediate decrease in revenue, Trump may abolish certain tax deductions. Although the elimination of, or cap on, the tax exemption of municipal bonds has not been specifically addressed, municipal market participants are anxiously awaiting Trump’s positioning on this matter. This idea was floated by President Obama in 2011, but after failing to receive broad support in Congress, it silently fell off the radar after the 2012 election. It should be noted that any changes in tax rates are unlikely to occur until 2018, at the earliest. The prospect of lower marginal tax rates could result in reduced demand for municipal bonds. 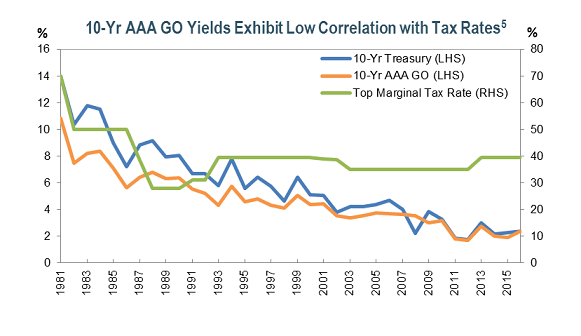 Yet the data from as far back as 1980 shows little correlation between marginal tax rates and municipal yields.3 Since 1980, the highest marginal tax rate has ranged from a peak of 70% to a low of 28%.4 During this time, the yield on the 10-year AAA GO has largely moved in tandem with the 10-year Treasury yield, despite fluctuations in the top tax rate.3 This apparent indifference may be explained by the typical municipal bond holder’s tax profile, which may be lower than the highest marginal tax rate.3 As a result, a reduction in the top tax rate may not affect the average municipal bond investor, potentially leaving demand intact. The presidential election has not been the only factor weighing on the markets. With the Federal Reserve Board (Fed) meeting in December, the possibility of a rate hike is in play. While the momentum for an increase has been building since October, the market’s expectation of a rise in rates has picked up since the presidential election. 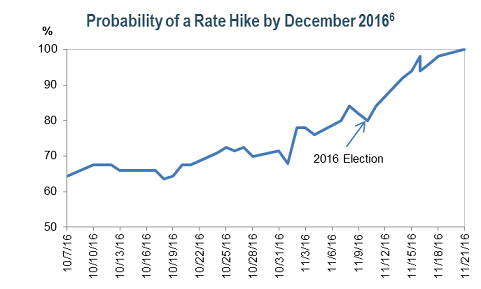 Since election day, the probability of a rate hike has increased from 84% to 100% as of November 21st.6 Historically, municipal bonds have outperformed in a rising rate environment because retail investors are most concerned with the absolute level of rates. As rates increase, so too does demand for these bonds. In just the last two months, the yield on the 10-year AAA GO has increased an eye-opening 100bps to 2.6%.7 Municipal bonds have other beneficial attributes, some of which include high overall credit quality, minimal default rates, and low correlation with other asset classes. Municipal bonds, which typically exhibit a low correlation to equities and the broader bond market, historically have outperformed in a rising rate scenario. While rising interest rates may result in decreased returns, the decline may be mitigated by increased income from higher reinvestment rates. 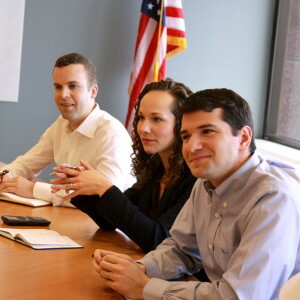 At IR+M, our municipal and crossover strategies are duration-neutral and include a convexity advantage. Therefore, when yields decline, we expect that our portfolios will experience larger price increases; and when yields increase, we expect that our portfolios will experience smaller price declines. An additional inherent protection is our ability to increase our exposure to floating rate securities, which may provide incremental yield and limit duration risk. Accordingly, these strategies have the potential to perform well in a multitude of interest rate scenarios. At IR+M, we believe that our structural convexity advantage is one factor that can help drive excess returns in the most challenging interest rate environments. With yields expected to climb, we believe that our well-diversified, duration-neutral municipal and crossover strategies are viable options for investors who are in search of high quality, low volatility investments. 1SIFMA. 2The Bond Buyer. 3Citi. 4Tax Foundation. 5Tax Foundation, Bloomberg Barclays, and Thomson Reuters through 11/30/16. 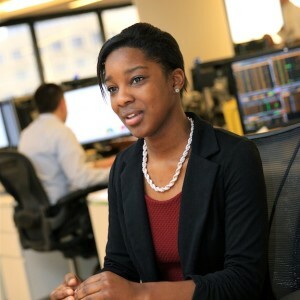 6Bloomberg Barclays. 7Thomson Reuters through 11/30/16. 8Bloomberg Barclays as of 12/31/15. The views contained in this report are those of IR+M and are based on information obtained by IR+M from sources that are believed to be reliable. This report is for informational purposes only and is not intended to provide specific advice, recommendations for, or projected returns of any particular IR+M product. No part of this material may be reproduced in any form, or referred to in any other publication, without express written permission from Income Research & Management.